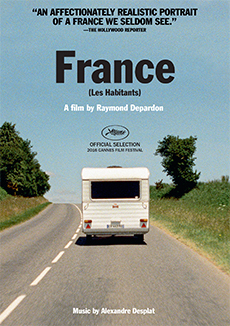 FRANCE (LES HABITANTS) is included in the same DVD box set with JOURNAL DE FRANCE and 12 DAYS. The vintage camping trailer making its way along France’s secondary highways looks utterly unremarkable. But once Raymond Depardon parks it—in front of stores, businesses, and town squares across the country—it become the location for dozens of remarkable conversations. Through his documentary films and photography, Depardon is known as one of the great chroniclers of contemporary France. In FRANCE, he takes a new approach: he mics his trailer, installs cameras pointed at a small table by the window, then invites strangers to come in and have a conversation with each other. (Depardon himself is never on-camera.) The participants range in age from their teens to their 80s: couples, friends, parents, children. Despite, or perhaps because of, the unusual setting, many of the conversations are strikingly intimate. A young man talks to his girlfriend about how he struggles with her jealousy. A single mother working as a stripper vents all her frustrations to a near-silent friend. Two high school seniors reminisce about their school days in a scene straight out of a coming-of-age film. A mother tries to make her son understand how his destructive behaviour affects the whole family and causes endless worry. Some of the conversations feel like near-perfect one-act plays, like the one with a middle-aged couple (he’s a fortune-teller, she’s a self-described rationalist) who start off talking about holiday plans and end up wondering why they are together. FRANCE does not set out to offer a definitive overview of French life. But certain themes do emerge, including women who find themselves in difficult relationships or chasing after exes for child support; parents worrying about their adult children and feeling left out of their lives; young men with appallingly retrograde attitudes towards women; and young couples who face challenges with trepidation but also who clearly delight in each other’s company. FRANCE is an immensely compelling documentary, plunging us unfiltered into the lives of a wide range of people we would not otherwise encounter. Filmmaker-photographer Raymond Depardon chronicles the patients of a psychiatric ward where justice and madness meet.